Bryce Harper was born on Friday, October 16, 1992, in Las Vegas, Nevada. Harper was 19 years old when he broke into the big leagues on April 28, 2012, with the Washington Nationals. His biographical data, year-by-year hitting stats, fielding stats, pitching stats (where applicable), career totals, uniform numbers, salary data and miscellaneous items-of-interest are presented by Baseball Almanac on this comprehensive Bryce Harper baseball stats page. Did you know that Bryce Harper skipped his final year of high school, earned his GED, then played one season of junior college baseball - where he primarily played catcher - to become eligible for the draft and get a head-start on his professional career? 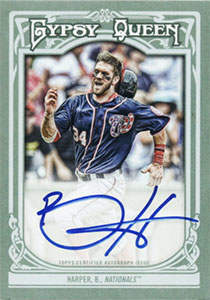 Did you know when Bryce Harper tied the National League record for home runs in back-to-back games ( May 6, 2015 and May 8, 2015 ), he was the youngest player in baseball history with five home runs across two consecutive games ? Did you know that Bryce Harper was the first left-handed batter in team history to hit 40-or-more home runs in a single season? In 1999 , Vladimir Guerrero hit 42 home runs with the 1999 Montreal Expos , then a year later he hit 44 home runs with the 2000 Montreal Expos , the first player in franchise history to reach 40. Then in 2006 , Alfonso Soriano set the franchise record for most home runs in a single season when he hit 46 home runs with the 2006 Nationals . Both Guerrero & Soriano were right-handed sluggers. Did you know that Bryce Harper was the first player in franchise ( Washington Nationals / Montreal Expos ) history to win a Most Valuable Player Award , and, he was the youngest ever unanimous MVP in baseball history? Bob Feller ( 1938 All-Star Game ), Dwight Gooden ( 1984 All-Star Game ) and Bryce Harper ( 2012 All-Star Game ) are the only teenaged Major League players in history to be named to a Midsummer Classic [Harper being the youngest position player ever selected]. Bryce Harper Video | Bryce Harper Sets Walk Record | MLB Advanced Media, LP.